A charming print showing a Japanese lady elegantly attired, western-style, standing beside a river with steamboats and foreign buildings in the background. She wears a full length coat, lace-trimmed, with colour-coordinated brolly, belt, cuffs and bow at the neck. On her head a stylish bonnet tied below the chin. From a set: Kokin meifu kagami, “A Mirror of Famous Women in Old and Modern Times.” This design shows Kosome, the daughter of Kuniya Sohei. 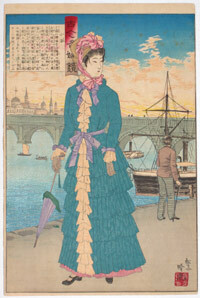 During a boat trip around Japan in 1859 her vessel was hit by a storm and drifted until eventually arriving in Hawaii. Rescued by an American, she went on to study and become a teacher in America. The view behind her shown here obviously represents America. Fine impression and colour with mica on the water. Light album backing and slight offsetting at top, otherwise good condition. Signed Shosai Ginko.